The Moon Illusion is probably the oldest optical trick that the world plays on us. When the moon is on the horizon, it appears to be huge and dramatic. When it's directly overhead it seems no more than a dime-sized light in the sky. Why the extreme difference in apparent size. There are a lot of theories as to why our eyes keep getting fooled. Has the Moon created the world&apos;s most enduring optical illusion? 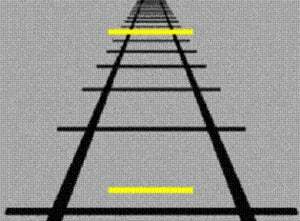 One of the most enduring explanations is the Ponzo Illusion. Take look at the yellow lines on the right. The one that appears to be farther away on the black "train tracks" looks bigger, but it's not. It's the same size, but our brains, thinking that it's farther away, give it a little more credit than it's due. It certainly works with things like imaginary train tracks, but is it the truth? A new group of moon watchers say no. 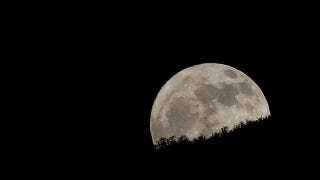 Two researchers at Susquehanna University think that the moon illusion works exactly the other way around. They believe that our eyes give cues to our brain that the moon on the horizon is closer to us than a moon far up in the sky. The brain being the helpful organ it is, it will magnify the size of the closer moon in our mind, and we'll see it as bigger. First the researchers proved that people will always see the moon as in front of the background of sky. Humans are more likely to perceive a shape against a solid background as an object in front of the background — it's why we don't think of the moon as a hole in the sky through which light shines. So far our vision is letting us know that the night sky is behind the moon. But how far away are both of these things? We get a clue to that by using our binocular vision — two eyes. We make up a three dimensional picture of the world because each eye gets a slightly different view of an object. The more those views differ, the closer we know an object is to us. This is why putting a hand right up in front of your face and closing one eye and then another will give you two radically different views of the hand, while looking across the street at a house and closing each eye in turn with give you only a slightly different view of the house. Closing one eye then the other will give you an infinitesimally different view of the moon, so we know it's very far away indeed. When it's high in the sky, that negligible difference in view is all we know about its distance, and so it seems far away and small. When it's on the horizon, though, we see have other objects to compare it to. We know they are far away, and their images don't shift much between one eye and the other. They do shift a little, though, and in our mind, because the moon is near them, the moon shifts with them. Because of this shift, we see the moon as much bigger on the horizon than up in the sky. ...possibly. This is simply another theory on how the illusion works, but so far no one has proved they're right. What do you think causes the moon illusion? Do we think the moon is far away? Or close? And how much does that matter?